Publisher Square Enix and developer Avalanche Studios have officially announced Just Cause 3, the third installment in the hit video game series. The games are known for their massive open worlds to explore, and the third entry will bring fans to the Mediterranean. You can read more about the game and see a preview image and video below. Just Cause 3 will be released in 2015, and will be released on PC, PlayStation 4, and Xbox One. 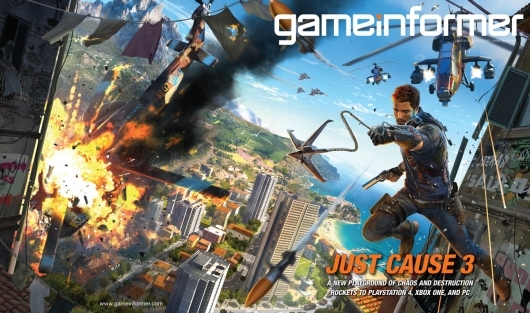 The game is Game Informer‘s December cover title, and you can find exclusive coverage throughout the month there. For now, here’s a quick behind-the-scenes preview video and a peek at the game via the magazine’s cover. Rumor: Spider-Man’s Aunt May To Get A Solo Movie?